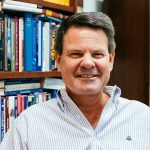 Clay Calvert, director of the Marion B. Brechner First Amendment Project at the University of Florida College of Journalism and Communications, was selected by the UF Honors Program to serve as an Elizabeth Wood Dunlevie Honors Term Professor for 2018-19. As part of this program he will teach an Honors Signature Seminar, “Free Speech and the First Amendment,” during the spring 2019 semester. Separately, Calvert will teach a fall 2018 Honors seminar entitled “Petty: The Biography” based on the book by Warren Zanes. Zanes will visit CJC on Sept. 27 as part of its Great Storytellers series.